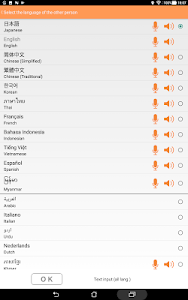 VoiceTra supports 31 languages and can be downloaded and used for free. 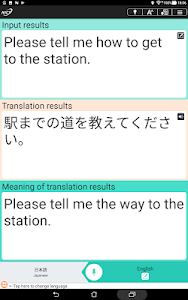 With an easy-to-use interface, you can also check if the translation results are correct. VoiceTra, whether to enhance your travel experience or to welcome visitors to Japan, will definitely come in handy as your personal speech translator. VoiceTra utilizes high-precision speech recognition, translation, and speech synthesis technologies developed by the National Institute of Information and Communications Technology (NICT). 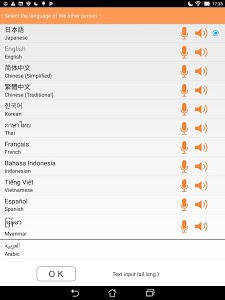 It translates your spoken words into different languages and outputs the results in a synthesized voice. 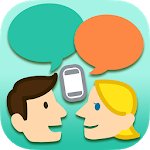 The translation direction can be instantly switched; 2 people that speak different languages can communicate using a single device. 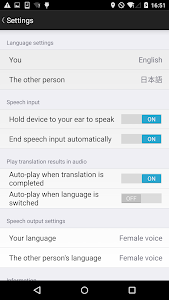 Text input is available for languages that do not support speech input. *VoiceTra has also been introduced as a disaster-prevention, disaster-related app. 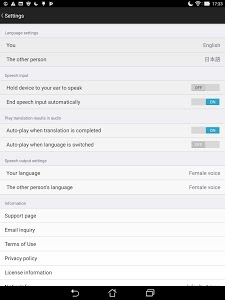 While VoiceTra can be used as a dictionary to look up words, it is recommended to input sentences as it interprets the meaning from the context to output the translation results. 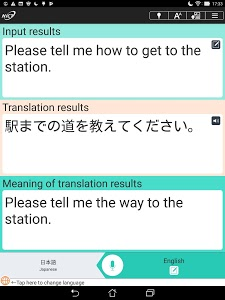 It may take a while to display the translation results depending on the network connectivity. Languages available for text input are those that the OS keyboard supports. The characters may not be displayed properly if the appropriate font is not installed on your device. Please note that some of the functions or the application itself may be disabled when the server is down. Users are responsible for the communication fees incurred to use the application. Please be aware that international data roaming charges can be expensive. 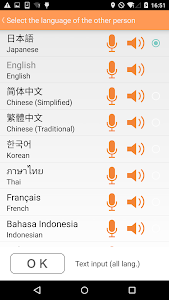 The recorded data will be utilized to make improvements in speech translation technologies. 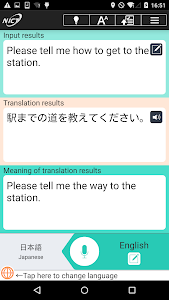 ・Changing the translation target language is now available by tapping the globe button on the bottom left of the main screen.